William Franklin "Bill" Conkright (April 17, 1914 – October 27, 1980), known more commonly by the nickname Red, was an American football center and end who played eight seasons in the National Football League (NFL) and was later the head coach of the Oakland Raiders for part of the 1962 season. Conkright was born in Oklahoma and attended the University of Oklahoma, where he was a star center on the school's football team. He was the captain of the Sooners team in 1936 and was named to a first-team all-Big Six Conference squad. Conkright was drafted in 1937 by the NFL's Chicago Bears. He played two seasons for the Bears, serving mainly as a backup center and occasionally playing as an end. The Cleveland Rams bought the rights to Conkright in 1939, and he stayed with the team through the 1942 season. He played for the Washington Redskins and Brooklyn Dodgers in 1943 before returning to the Rams briefly in 1944. Following his retirement as a player, Conkright began a career as a coach. He scouted and coached for the Rams in 1944 and 1945, and moved to the Cleveland Browns of the new All-America Football Conference (AAFC) in 1946. He worked as an assistant coach for two more AAFC teams in the late 1940s. Conkright was hired as an assistant at Mississippi State College in 1950, spending two seasons in the position. After a five-year hiatus from coaching, he returned as an assistant for the University of Houston's football team. He got his first head coaching job in 1959 at Stephen F. Austin State University. In 1962, Conkright was hired as an assistant coach and director of player personnel by the Oakland Raiders in the American Football League. The team's head coach, Marty Feldman, was fired in the middle of the season and Conkright replaced him. Conkright's Raiders, however, managed to win just one game that year, and he was replaced in 1963 by Al Davis. Conkright went on to work for two years as an assistant with the Houston Oilers. Conkright was born in Beggs, Oklahoma and went to a high school in Tulsa, where he was a football star. He was nicknamed "Red" because of his red hair. Conkright attended the University of Oklahoma and played varsity college football during the 1934, 1935, and 1936 seasons. He was the team's captain as a senior in 1936, and was named a first-team All-Big Six Conference center. Conkright was missed when he graduated; sportswriter Federick Ware wrote in the 1937 edition of Football Illustrated Annual that "finding a center to replace the great Red Conkright" would be one of Sooners head coach Tom Stidham's "main headaches." Conkright was selected in the fifth round of the 1937 draft by the Chicago Bears of the National Football League (NFL). He was a third-string center for the Bears behind Frank Bausch and Frank Sullivan with the Bears, and saw little action in the two years he played for the team. He was, however, occasionally used as an end in his first season. 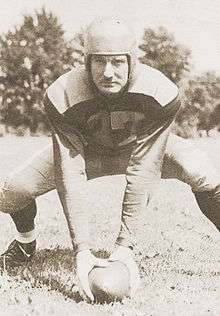 Conkright was sold to the Cleveland Rams ahead of the 1939 season in a cash deal that did not involve any other players. He became the regular starter at center for the Rams midway through 1939, replacing Chuck Cherundolo. The Rams finished the season with a 5–5–1 win-loss-tie record under coach Dutch Clark. Conkright broke his leg in the second game of the 1940 season and sat out the rest of the year. In October, he married his girlfriend Imogene, who he met at the University of Oklahoma and with whom he had a four-month-old son. Conkright came back to play full seasons for the Rams in 1941 and 1942. He split the 1943 season between the NFL's Brooklyn Dodgers and the Washington Redskins. Conkright returned to the Rams in 1944 and was expected to be used as a regular left end. He saw action in only one game, however, his final appearance in the NFL. He was then placed on the inactive list and converted into an assistant coach and scout for the Rams. Conkright remained with the Rams through the 1945 season, when the team won the NFL championship. Rams owner Dan Reeves moved the team to Los Angeles after the season, but Conkright decided to stay in Cleveland, where he and his family lived. He took a job as a scout and coach for the Cleveland Browns, a team that was to start play in 1946 in the new All-America Football Conference (AAFC). Conkright was joined by five former Rams players who switched to the Browns when the Rams moved, including center Mike Scarry, tackle Chet Adams and backs Gaylon Smith, Tommy Colella and Don Greenwood. Before the 1946 season started, Reeves sought an injunction in federal court to prevent Adams from signing with the Browns and force the tackle to honor his contract with the Rams. Adams argued that his contract described a team in Cleveland, and the move to Los Angeles invalidated it. Then acting as an agent for the Rams, Conkright had signed Adams to a new contract in October 1945. Conkright was named as a defendant in the suit, which was decided in August in Adams's favor. Conkright spent a year as Cleveland's end and center coach under head coach Paul Brown as the team won the 1946 AAFC championship. While with the Browns, he coached ends Mac Speedie and future Pro Football Hall of Fame member Dante Lavelli, who he praised for his "uncanny way of getting into the open" to receive passes from quarterback Otto Graham. Conkright signed as an end and center coach for the AAFC's Buffalo Bills in April 1947. In moving to the Bills, he rejoined Tom Stidham, his old head coach at Oklahoma. Stidham was working as the Bills' line coach. Conkright convinced the Bills to put into place Brown's version of the T formation offense, and the team improved in the 1947 and 1948 seasons. The Bills advanced to the 1948 AAFC championship, but lost the game to the Browns. Conkright was hired as an assistant coach by the Baltimore Colts in 1949, and spent one season with the team. He took a job as an end and center coach for Mississippi State College in 1950 and spent two seasons there. After five years away from football, Conkright in 1957 became a defensive line coach at the University of Houston. Two years later, he was named the head football coach at Stephen F. Austin State University in Nacogdoches, Texas. In three seasons as coach there, his football team did not have a winning season and posted an overall win-loss-tie record of 6–25–1. Conkright resigned as Austin's head coach late in November 1961. The following April, he was hired by the Oakland Raiders of the American Football League (AFL) as defensive line coach and director of player personnel on the staff of head coach Marty Feldman. Following a 2–10 season in 1961, the Raiders opened the 1962 season with five straight losses, leading to Feldman's dismissal and his replacement by Conkright as interim head coach on October 16, 1962. The Raiders finished the season with a 1-13 record under Conkright, and he was replaced in January 1963 by Al Davis. After his firing by the Raiders, Conkright joined the coaching staff of the AFL's Houston Oilers. He was an assistant for the Oilers in 1963 and 1964. Conkright died in 1980 in Houston, Texas. He was 66 years old. 1 2 3 4 Dietrich, John (October 6, 1939). "Bear Castoff To Start For Rams". Cleveland Plain Dealer. p. 23. Opportunity arrives Sunday for William (Red) Conkright, the No. 2 center of the Cleveland Rams. Conkright ... will start the game against the Chicago Bears ... Nothing better could be desired by the rugged Conkright, who served two seasons with the Bears, warming the bech most of the time. Third in line of succession to the center job, with Frank Bausch and Frank Sullivan in front of him, Conkright never received a thorough trial. Last summer he was sold to Cleveland. Conkright is 25, and was a star at Tulsa High and the University of Oklahoma. 1 2 "Rams Get New Center in Cash Deal With Bears". Cleveland Plain Dealer. August 14, 1939. p. 13. Purchase of William Conkright, 205-pound red-headed center who has been with Chicago Bears for two seasons, was announced last night by the Cleveland Rams of the National Football League. The deal was for cash, with no other players involved. ... He probably will alternate with Chuck Cherundolo, star pivot man of the Rams for the last two years. 1 2 3 4 Roberts 1940, p. 12. 1 2 "Conkright To Coach". St. Petersburg Times. Starkville, Miss. United Press International. February 7, 1950. p. 21. Retrieved September 3, 2012. ↑ "5 Nebraskans Rate All-Star". Prescott Evening Courier. Kansas City. Associated Press. December 3, 1936. p. 5. Retrieved September 2, 2012. ↑ Ware 1937, p. 74. 1 2 Dietrich, John (September 12, 1944). "Conkright Will Be Regular End For Ram Eleven". Cleveland Plain Dealer. p. 13. In his seventh season in the National Football League, William (Red) Conkright, veteran center of the Cleveland Rams, has become one of the team's chief hopes for more whiz in its passing attack. ... This switch isn't as radical as it sounds. Conkright, who was captain of Oklahoma in 1937, played an end in his first pro season with the Chicago Bears in 1938, and numbers as one of his chief thrills having scored a touchdown for the Bears that fall. He came to Cleveland in 1938, and immediately became a center. ↑ "Cleveland Rams". Football Almanac. Archived from the original on October 7, 2012. Retrieved September 3, 2012. ↑ "It's Family Life for These Pro Gridders as They Train and Play for Rams in National League". Cleveland Plain Dealer. October 19, 1940. p. 17. Mrs. Imogene Conkright married Bill, Rams' center, after they had attended the University of Oklahoma together. They have a four-month-old son, William, jr., and live at Minden, La. Conkright suffered a fractured leg three weeks ago and will be out for the rest of the season. 1 2 3 "Bill Conkright". NFL.com. Archived from the original on October 7, 2012. Retrieved September 3, 2012. 1 2 3 4 "Conkright Leaves Rams For Post With Browns". Cleveland Plain Dealer. February 15, 1946. p. 20. William (Red) Conkright, former star center and for the past two years assistant coach and scout for the Cleveland Rams, has jumped to the Cleveland Browns of the new All-America Conference and already is at work on his new job. With the Browns, the duties of Conkright will be about the same as they were with the Rams. He is already scouting and signing players, and will act as end coach on Lieut. (J.G.) Paul Brown's formidable staff of experts. Conkright, who is 31 ... was one of the standout centers of the league, but in 1944 was placed on inactive status as a player and became coach and scout. Conkright makes his home in Cleveland, and apparently quit the Rams and joined the Browns primarily for that reason. 1 2 3 "Court Acts to Speed Adams Grid Decision". Cleveland Plain Dealer. August 28, 1946. p. 16. It was Trenkamp's argument that Adams had signed to play with the Cleveland Rams and not with the Los Angeles Rams of the National Football League and that when Reeves transferred the Rams' franchise from Cleveland to Los Angeles, Adams was not bound to play for Reeves' club. 1 2 3 "Conkright Is Second Browns' Aide to Shift". Cleveland Plain Dealer. April 16, 1947. p. 18. William F. (Red) Conkright, end coach and scout for the Cleveland Browns last season, yesterday became the second member of the All-America Conference champions' coaching staff to resign. He has accepted a similar position with the Buffalo Bisons, where he will be reunited with his college mentor, Tom Stidham, now Buffalo line coach. ↑ Sauerbrei, Harold (December 18, 1946). "Lavelli Carries Four Pass-Catching Records Into Title Game". Cleveland Plain Dealer. p. 22. ↑ Cobbledick, Gordon (December 19, 1948). "Plain Dealing". Cleveland Plain Dealer. p. 8B. ↑ "Colt Rookies Don Uniforms". The Baltimore Sun. July 22, 1949. Retrieved September 3, 2012. 1 2 3 "AFL Raiders Hire Third Head Coach". Schenectady Gazette. Oakland, Calif. Associated Press. October 17, 1962. p. 27. Retrieved September 3, 2012. 1 2 "Austin College Hires UH Aide". The Victoria Advocate. Nacogdoches, Tex. Associated Press. January 20, 1959. p. 7. Retrieved September 3, 2012. ↑ "William F. "Red" Conkright Records by Year". College Football Data Warehouse. Archived from the original on October 7, 2012. Retrieved September 3, 2012. ↑ "Austin Grid Coach, Ex-Sooner, Resigns". Daily Oklahoman. November 30, 1961. ↑ "Add Michaels As Raider Aid". The Milwaukee Sentinel. Oakland, Calif. Associated Press. April 4, 1962. p. 7. Retrieved September 3, 2012. ↑ "Al Davis Signed To Coach Oakland". The Miami News. Oakland, Calif. Associated Press. January 20, 1963. p. 5C. Retrieved September 3, 2012. ↑ "Datelines In Sports". Los Angeles Times. February 20, 1963. Retrieved September 3, 2012. ↑ "Steelers' Rooney Takes Appleton Case in Stride". Pittsburgh Post-Gazette. February 3, 1964. p. 26. Retrieved September 3, 2012. ↑ "United States Social Security Death Index, William Conkright, 1980". Familysearch.org. Archived from the original on October 7, 2012. Retrieved September 3, 2012. Roberts, Howard (1940). Who's Who in Major League Football. Chicago: B.E. Callahan. Ware, Frederick (1937). 1937 Football Illustrated Annual. New York: Fiction House, Inc.